Šparoga is asparagus (Š is pronounced 'sh'). This is one of the many gastronomic delights that grow here in Istria. 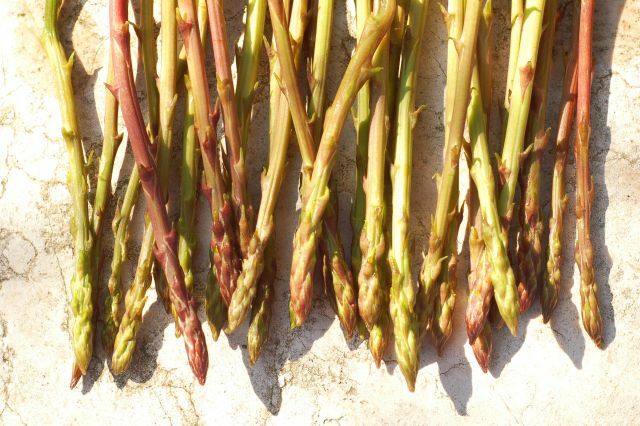 Asparagus shoots make their appearance in the early spring, growing in forests. They have a strong and distinctive flavour, and are most commonly eaten scrambled with eggs, in risotto or with pasta and a drizzle of olive oil. Searching for šparoga is a mysterious phenomenon: at first, the apprentice šparoga hunter will be totally blind and won't see any - although everybody else bring back bunches of them. Then, mysteriously, you suddenly start to see them! Yes, it takes a trained eye to spot those young asparagus shoots!